A portrait of Rupert Murdoch and an image inspired by plastic bags are on the shortlist for this year's National Portrait Gallery photographic prize. 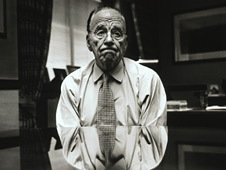 Murdoch Reflects, by UK journalist Tom Stoddart, and The Bag, by Dutch artist Hendrik Kerstens, were among four works selected from 6,758 submissions. Also on the shortlist for the £12,000 award is Ines Connected with Amina by French artist Catherine Balet. The list is made up by Quints, photographed by Briton Lottie Davies. National Portrait Gallery director Sandy Nairne said judges were "hugely impressed" by submissions for the Photographic Portrait Prize. "These are great portraits of our time," he added. Kerstens' The Bag was born from the artist's observation about the large number of plastic bags given away by New York shops. Balet's Ines Connected with Amina, meanwhile, shows a girl using her laptop while her friend uses a mobile phone. And Quints is based on a nightmare Davies' friend had about getting pregnant with quintuplets.